USA Football is focused on a better, safer game. To that end, in 2017, we released the still well-received Shoulder Tackling System. It was built in conjunction with the Seattle Seahawks and gave coaches drills and fundamentals to execute an efficient and safer type of tackle. 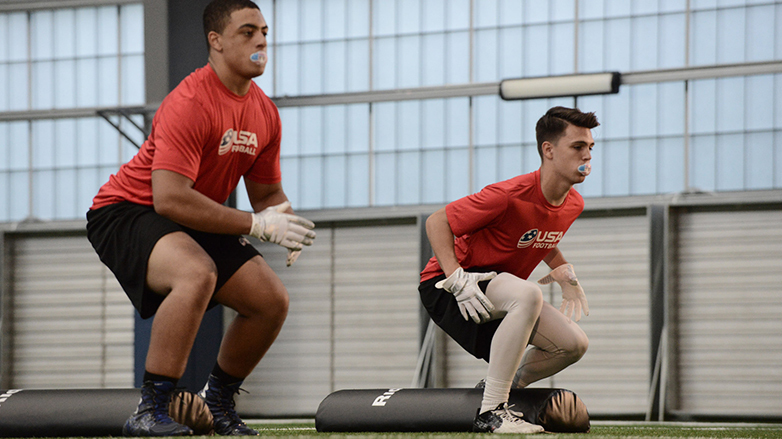 This week, we announced the launch of our Advanced Tackling System, which builds upon the Shoulder Tackling System and the tackling principles taught within Heads Up Football and USA Football’s coach certification. The Advanced Tackling System uses the 5 Fights progression developed by multi-sport tackling expert Richie Gray during his time in rugby and with the Miami Dolphins. This progression allows the Advanced Tackling System to layer on top of any tackling system a coaching staff may be using, including the existing Shoulder Tackling System. These are not physical fights. They represent the struggle and the mental toughness to execute every part of the tackle at a world class level. Every tackle is composed of those five elements and their corresponding Key Performance Indicators (KPIs). KPIs help coaches work with their players at every step of the progression to develop the skills necessary to improve making any kind of tackle. That’s the key here. The Advanced Tackling System doesn’t just work in the perfect world scenario. For example, if a player doesn’t have the perfect body position because of a blocker’s presence, a staff can now leverage the system to develop the techniques necessary to make a one arm tackle while fighting pressure from the blocker. The beauty here is that this system works no matter what your foundational system is for tackling. While the Shoulder Tackling System is the gold standard as a foundation, staffs often have to go beyond those three tackle types. The Advanced Tackling System gives them a framework to do that successfully. The Advanced Tackling System is also more than just a series of drills. It was truly designed as progression to understand, build up and break down the tackle. Once a coaching staff and their players understand the 5 Fights, they can use them to evaluate their performance in game, in film review and in practice. When we tested the Advanced Tackling System with collegiate and high school staffs during the 2018 season, we discovered that players were able to report their own usage of the 5 Fights progression as well as their teammates along with the corresponding KPIs. This also highlights the one unified and common language that both the staff and players can use to make sure they’re performing at the level necessary to achieve success. Evaluation and grading are critical for every team. Most of the time, coaches are looking at effort and schematic execution. Tackling isn’t often examined with the critical detail necessary to determine success. Tackle analytics aren’t often considered. Coaches grade the player and simply say the tackle was either made or missed. With the Advanced Tackling System, we teach you how to do proper grading and analysis within your scouting tool of choice. This helps coaches look for areas of strength and weakness, so they don’t have to say, “We missed a lot of tackles so we’re going to practice tackling this week.” Well, if you practice form tackle and thigh and drive, but you’re struggling when it comes to tackling below the knee and taking bad angles in the open field, you’re not fixing the actual problem. These evaluation lessons help coaches identify the exact problem areas within the tackle and for each individual defender and position group. This then leads us to the next item, in-practice performance. From what coaches and players learn in game and in film review, they can apply directly to their practice periods. Coaches can plan and program individual drills from the Advanced Tackling System into their practices to address the flaws that separate their players from executing world class tackles. We encourage coaches to start with certification’s Shoulder Tackling drills and then to take the additional drills in the free Shoulder Tackling System. This lays a good foundation for how to execute three very common and essential tackle types. It also provides key fundamentals to help ensure success. For coaches who have already taken those or are familiar with the techniques, we encourage you to jump into the Advanced Tackling System by trying three lessons free. When you subscribe to the complete premium system, you’ll gain a better understanding on how to build a better tackle through the full progression.